At the office of Dr. Jacob Myers, we feel honored to spend our days helping children build a foundation for a lifetime of healthy smiles. From regular children’s dental checkups and composite dental fillings to tooth crowns and space maintainers, we are proud to provide comprehensive children’s dental services to ensure that your child’s smile stays healthy and happy. Beyond performing these services in our East Lansing dental office, our team is dedicated to helping your child establish healthy habits for life. We believe that the earlier your child learns healthy dental habits, the more likely it is that he or she will adhere to them for life. Your child’s first set of teeth is vital to his/her health and development. Teeth help us to eat, speak, and smile, which are all important parts of childhood! Baby teeth also act as “placeholders” in the mouth for the adult teeth that will eventually emerge. Unhealthy teeth and gums can lead to premature tooth loss; the early loss of one of these important “placeholders” increases the risk of your child’s adult teeth growing in crowded or crooked. Establishing good oral care habits won’t just help your child have a shining smile now - it will set them up for long-term success. Your child can start to develop cavities as soon as his or her first tooth emerges. Be sure to book your child’s first dental appointment at our East Lansing pediatric dental office within six months of the first tooth emerging, or before the age of one. During your first visit, Dr. Myers will check your child’s gums and teeth for signs of decay, demonstrate brushing techniques, discuss fluoride supplements, and answer any of your questions about children’s oral care. 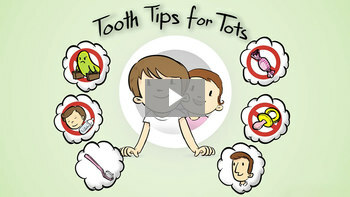 At the age of two, you can start to teach your children about brushing their own teeth. However, they will still need your help until they are approximately six years old, when they will have developed the motor skills to effectively brush their own teeth. Brushing your teeth doesn’t have to be a chore - there are ways to make brushing fun! Get a special toothbrush: There are endless options available, so buy a toothbrush in your child’s favorite color or featuring his or her favorite character to incentivize brushing. Make it a game: Buy a plastic hourglass so your child can track their progress, and establish some sort of reward system, be it gold star stickers or something else. Do it together! Your child loves spending time with you - model healthy habits from the beginning to set them up for a lifetime of success. We recommend that you bring your child in for dental checkups twice a year, or every six months. During these routine checkups, we will clean your child’s teeth and check for any signs of decay. If necessary, Dr. Myers can also apply topical fluoride to strengthen tooth enamel and/or apply sealants to the back teeth to keep tiny food particles from getting trapped in the grooves of those teeth. Brush their teeth at least twice a day. Avoid acidic drinks such as soda and energy drinks. Refrain from drinking alcohol or smoking tobacco. Continue visiting our East Lansing office for regular checkups and teeth cleanings. Visit Your East Lansing, MI Pediatric Dentist Today! Besides the at-home strategies discussed above, scheduling regular visits with your trusted East Lansing pediatric dentist is one of the most important steps you can take to prioritize your child’s health. Call us at (517) 337-0032 or fill out our online appointment request form today. We can’t wait to help your child get on the path towards a lifetime of healthy smiles!